Washington, D.C. seems like the center of the universe right now. The U.S. Government is going through a transformation in its norms and practices. While much of this can be attributed to President Trump’s unique management style, this is also part of a broader strategy to re-think America’s leadership on the world stage. There are numerous examples of the ‘America First’ policy shaping both the domestic and international arenas, however, the one constant in Washington’s ever-changing landscape is the leadership of the business community. Commercial Diplomacy has become more important than ever. As business interests in foreign markets continue, companies are cultivating ‘Corporate Ambassadors’ and participating in various international fora. While the political climate has become more business friendly in the corridors of government, companies are worried about their interests in countries affected by the America First trade policy. With the tension and challenges surrounding ongoing negotiations on NAFTA, KORUS and other trade agreements, the prospects of the United States co-signing multilateral trade agreements or developing new ones are quickly fading. Enter the steady leadership of the private sector. When all else is chaotic in the traditional channels for trade policy, private entities with profit incentives can be trusted to not only serve their bottom lines, but also do what is best for their employees, shareholders, industries and community. This interest is shared among the foreign diplomatic corps, which eagerly awaits calmer (and more predictable) days. Diplomats in Washington are representatives of their country’s governments, but increasingly they are representing their country’s strategic business interests. While in the U.S., most foreign Ambassadors are in pursuit of foreign direct investment – whether maintaining existing investments or making the business case for American companies to invest in their countries. These American businesses are increasingly interested in establishing new relationships with foreign diplomats to discuss issues regarding investment plans for a destination country. With the breakdown of traditional channels that help foster this important relationship building, the business and diplomatic communities are turning to new avenues for navigating their commercial interests. 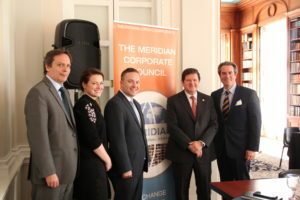 Enter the Meridian Corporate Council, the premiere forum for convening Washington’s foreign diplomatic corps, private sector and US Government in order to advance Commercial Diplomacy. Recently, the Corporate Council has hosted Ambassadors from Argentina, Ireland, Korea, the Philippines and Singapore for dialogues on economic ties and interests. These countries might be in different parts of the world and across continents, but their message is the same: a more prosperous and secure future can be achieved through transparency, predictability in markets, and adherence to free market concepts. Another issue that arises regularly is transparency in foreign markets, which is part of the overall predictability that the private sector yearns for when entering a new market. Clear laws on taxation, permitting, labor issues, and robust case law for commercial disputes are items that nearly every country looking to attract foreign capital must develop. Having a level playing field for both domestic and foreign investors is important for countries to manage and maintain. It ensures that foreign goods entering domestic markets are treated the same as domestically manufactured goods in terms of pricing, taxation and tariffs. While countries are tempted to build barriers to trade in order to prioritize national economic growth, sheltering domestic industry only stifles innovation and leads to negative effects such as the theft of intellectual property. With the upcoming G20 Summit, Summit of the Americas, ASEAN Summit, and other multi-lateral events planned for 2018, it will be interesting to see how the U.S. will continue its leadership on the world stage. America, through its soft power initiatives and public diplomacy, stands as a beacon of hope for the rest of the world, and initiatives like Meridian’s Corporate Council are more essential now than ever to bridging the divide between governments of the world and the private sector. This post was written by Puru Trivedi, Meridian’s Director of Corporate Relations and the Meridian Corporate Council. POST TAGS: Business, commercial diplomacy, Corporate Council, International Business, investment, public-private partnerships, trade.